Bradley Johnson is excited by the challenge of facing Manchester United. Derby County midfielder Bradley Johnson is relishing the opportunity for the Rams to test themselves against some of the top players in the world. Frank Lampard's men are at Old Trafford to face Manchester United tonight in the Carabao Cup third round, with United likely to field several of their big names. 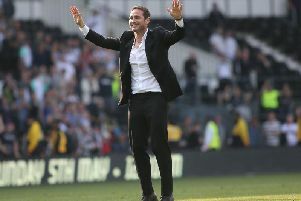 He told RamsTV: "It is always going to be tough at Old Trafford but we can look at it and say these are the teams that we want to be playing against week in, week out. When I signed here, the main aim has always been to get promotion and we haven’t got that yet but it’s a good test for us. “No matter what team they play, if they rest a few, then they will still be strong but as a player growing up, these are the games you want to be involved in. “We are going to Old Trafford, the history of that stadium speaks for itself and hopefully we can play against the best players in the world and it will be a massive test for us. “Look at the manager’s career, he’s been brought up with that winning mentality so he’s going to want to win everything he can. We’re not going out to say we are going to win the cup but every game we go into we want to win.